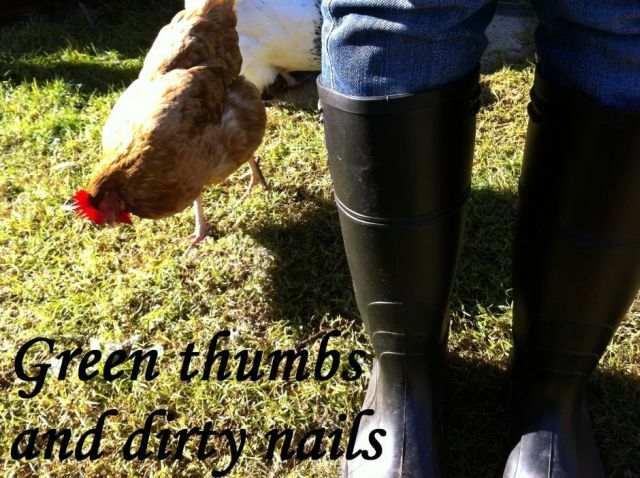 Green thumbs and dirty nails...: Pekin Bantams. 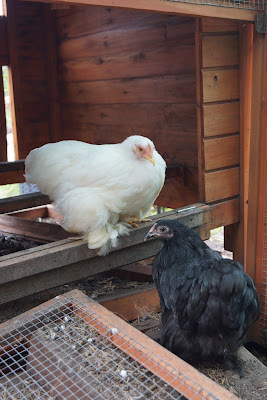 Our two new Pekin Bantams have settled into the coop nicely. I bought them from our local farmers markets a few weekends ago after Jamie had been complaining that we are not getting enough eggs from our two current chooks. I had planned on buying some more Isa Browns, or perhaps a couple of Australorps. But when I saw these two tiny ones in a cage all on their own, well, my heart melted and they came home with me. When we introduced them into the coop, there was the predictable behaviour from Lady Sussex and Liberty - a couple of pecks to make sure these two new comers understood the pecking order. On the first evening I got a fright, as I couldn't find these two anywhere in the yard. After closer inspection in the nesting box, I discovered two little heads poking out from under the wing of Lady Sussex. These two had wiggled their way under her wings in a search for warmth/comfort, and as she is broody at the moment she was happy to play mum to them! The ducks are not at all fussed by them, and have carried on as usual. We haven't named them yet. Jamie has been calling them Houdini 1 and 2, as they have a knack for getting into strange places.